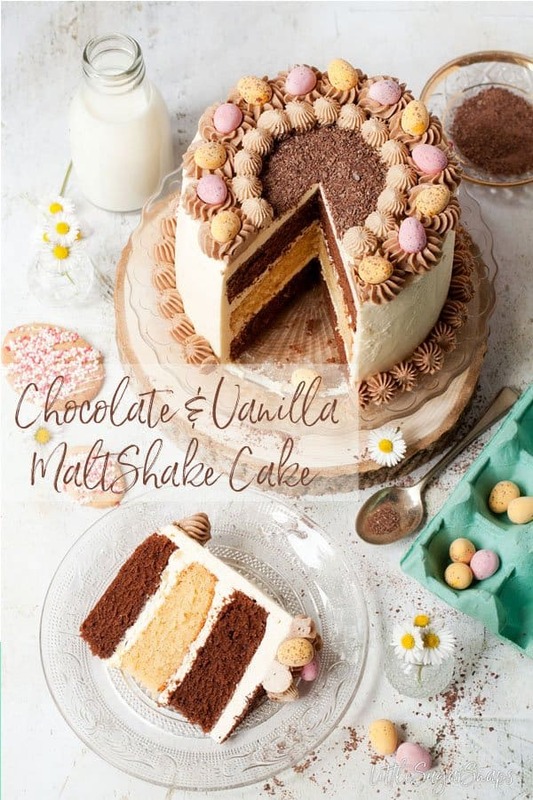 This Chocolate & Vanilla Malted Milkshake Cake contains 3 delicious layers of malted sponge cake all wrapped up in smooth and silky vanilla malted Italian buttercream. 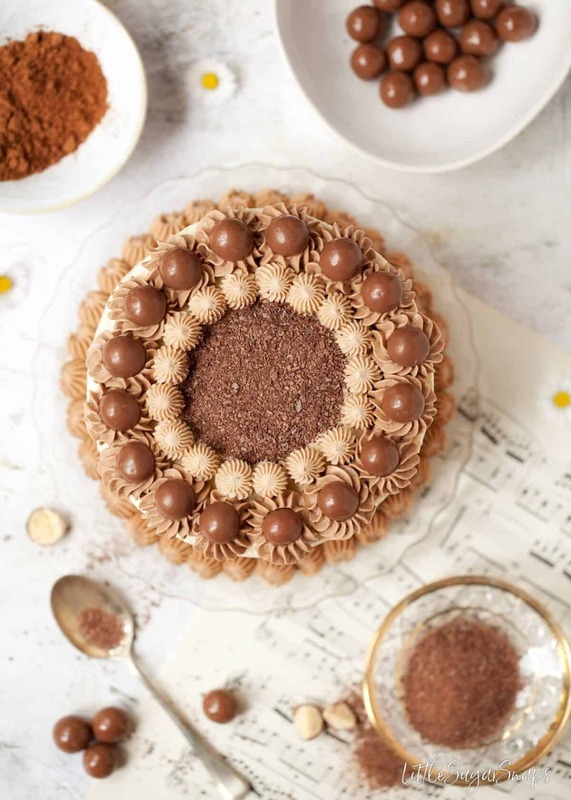 Top with malted chocolate balls or mini eggs for the ultimate milkshake inspired cake. After giving cake recipes a swerve for much of 2018 I’m back in the saddle with plenty for 2019. I have to confess, it does feel good. 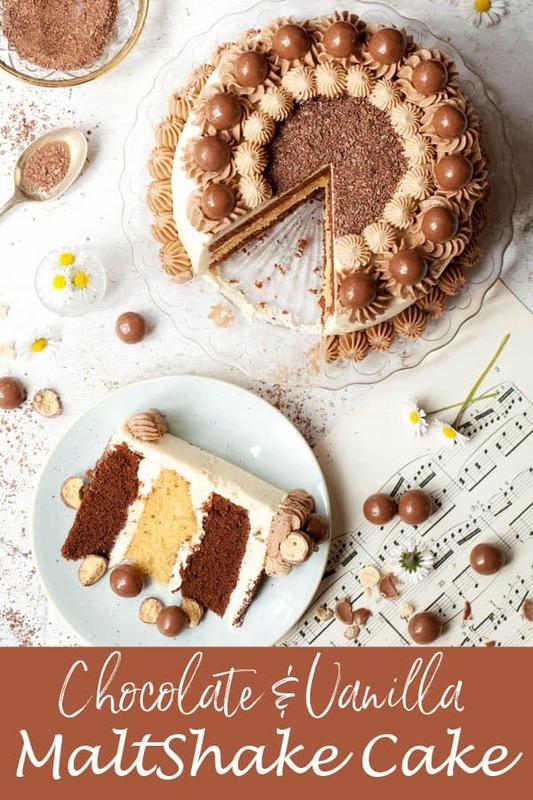 As satisfying as it is to present fancy desserts to you, my loyal heart will always belong to cake. My first sweet love. It’s recently been birthday season in my house – 2 kids with birthdays just 8 days apart makes March a busy month. A month full of celebrating, socialising and eating copious amounts of cake. Joy. Everything was going swingingly until my youngest came home from school with a nasty virus the day before her party. We had to cancel, so party season extends through to late April this year when the re-scheduled celebration takes place. Honestly, party season might feel never ending to me this year, but this girl didn’t grumble or moan about the derailment. She just lay there, too tired to be upset… looking sad… So she thoroughly deserves to get the chance to party hard in a few weeks time. The good news is that my girl was feeling fine on her actual birthday. And she was delighted with this Chocolate and Vanilla Malted Milkshake Cake that I came up with for her. She dropped a not very subtle hint beforehand that she hoped Mini Eggs might feature on her cake, so naturally, I obliged in that department. 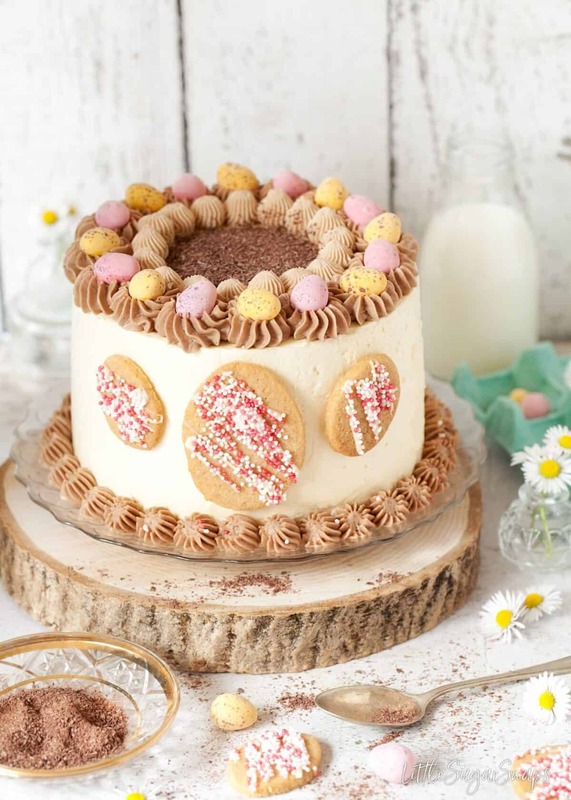 In fact, I thought I would tie in my recently published Malted Milk Biscuits with this malty bake and give the Mini Egg version a full Easter theme. I’m not convinced I executed my idea as expertly as I was hoping for. In hindsight, I think that, aesthetically, lots of smaller biscuit eggs placed randomly around the cake would have worked better. Regardless, there were no complaints from the birthday girl. 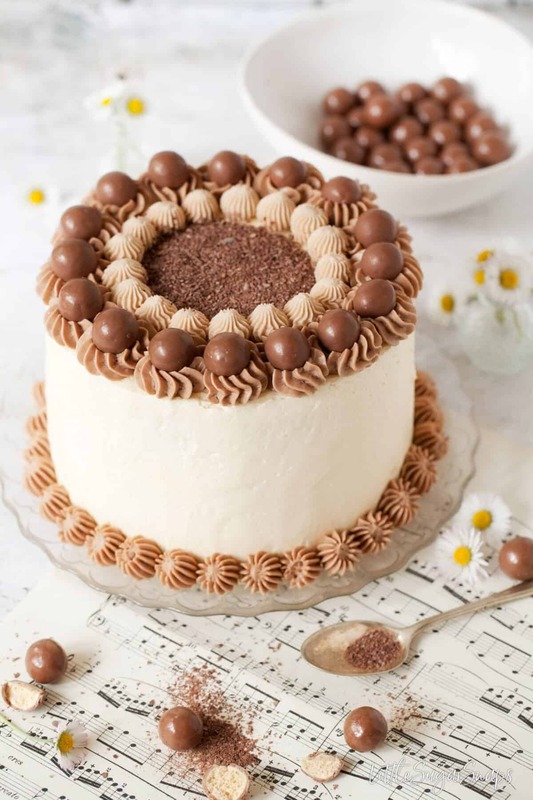 The cake itself is based on malted milkshakes. 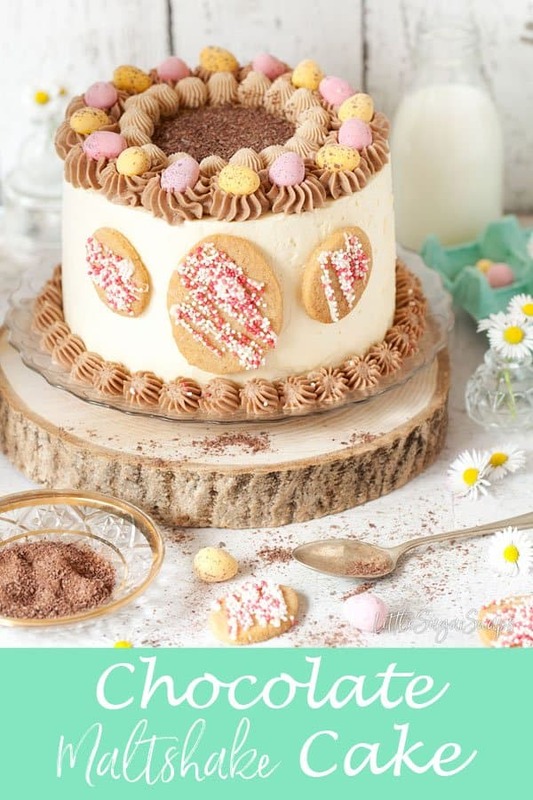 I went with our family favourites of chocolate and vanilla and then wrapped the layer cake up in some delectable Malted Vanilla Italian Buttercream. Bliss. Having recently acquired a stand mixer, I’m currently eager to try out lots of exquisite recipes that were previously too time-consuming to make by hand. Spurred on by the beautiful Swiss Buttercream in my recent Triple Layer Coffee Cake, I plumped for Italian buttercream. What’s the difference Between Swiss and Italian buttercream. Honestly, in terms of texture, it is hard to tell the difference. They are both wonderfully buttery and silky smooth. 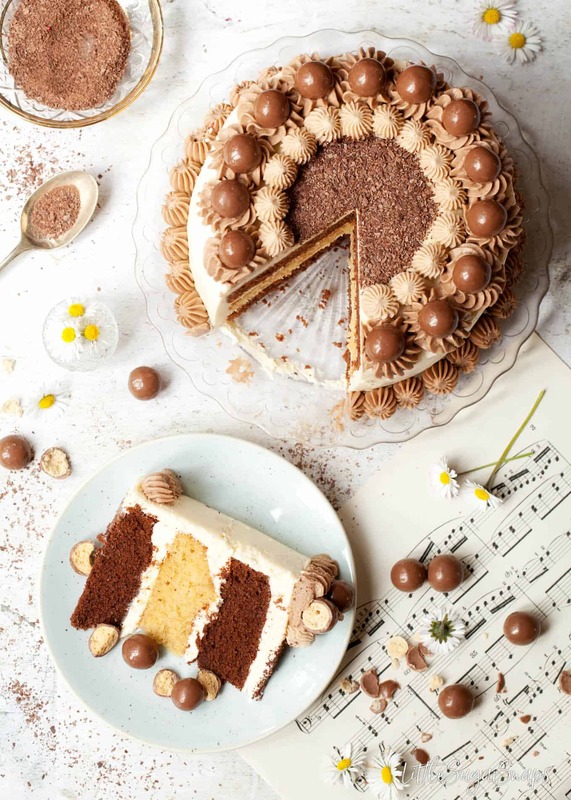 Tastewise, Italian buttercream is slightly sweeter than Swiss, but neither are too sweet and they are both much more pleasant to eat than regular buttercream – especially for adults. Swiss Meringue Buttercream is made by heating egg whites and sugar together to 71C/ 168F prior to whisking to stiff peaks. When the stiff peak stage is reached and the meringue has cooled, butter is added to produce a spectacular buttercream. To make Italian buttercream, a hot sugar syrup (115C/ 240F) is trickled slowly over stiff egg whites whilst they are being whipped. The mixture is continuously whipped until cool and then a lavish amount of butter is added, chunk by glorious chunk. 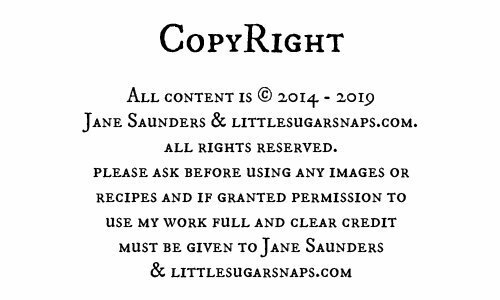 Both buttercreams require extensive whipping and, from personal experience, I would not recommend attempting either unless you have a stand mixer… or a burning desire to stand around holding electric beaters for a solid 45 minutes… thought not. 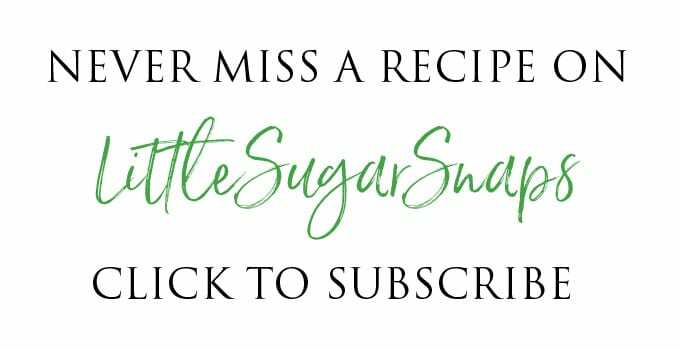 For more information on Swiss Meringue Buttercream hop over here or keep reading for the low down on Italian Buttercream. The buttercream is easy to flavour – do so at the very end, after the butter has been fulling incorporated. I flavoured my buttercream with malted milk powder dissolved in hot milk (cooled). The buttercream went onto my cake relatively smoothly (for me) and then I used my trusty Wilton Open Star 8b and the slightly smaller Wilton Open Star 4b to decorate it simply. The Maltesers/ Mini Eggs sit nicely on top of the larger piped shapes, adding the final touch of edible fun to this Chocolate and Vanilla Malted Milkshake Cake. 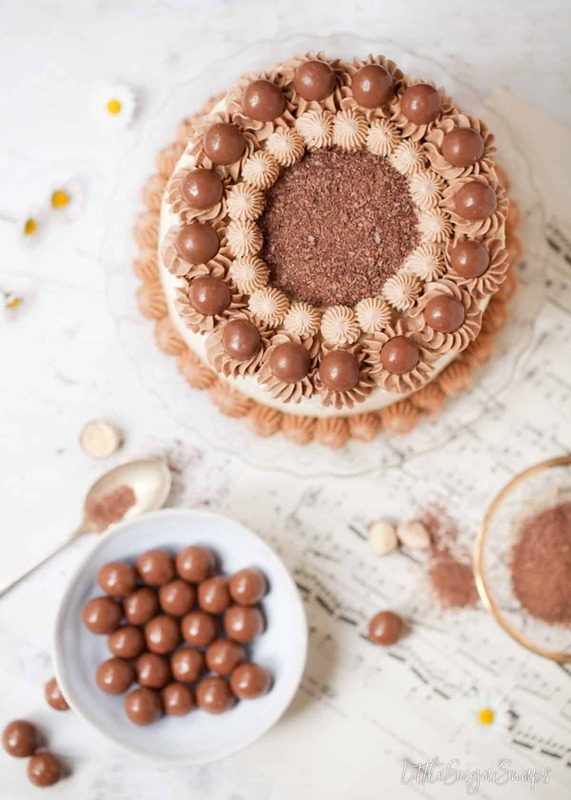 Have you made this cake? 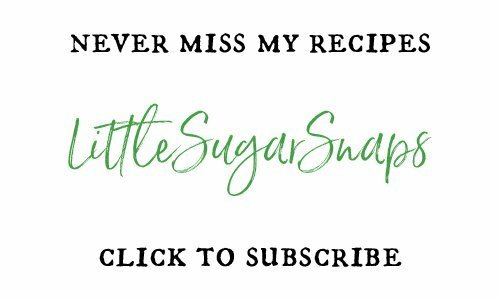 How about sharing your gorgeous creation on Instagram – don’t forget to tag #littlesugarsnaps so I can see it too. Use any remaining vanilla buttercream and the chocolate buttercream to pipe a simple design onto the cake. I used Wilton Open Star 8B and Wilton Open Star 4B tips. This recipe uses 3 x 6-inch baking tins. 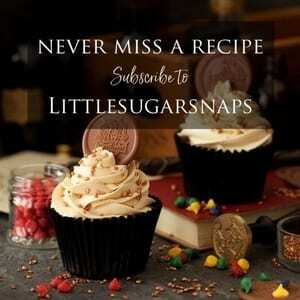 Do not stretch the recipe as listed to fit larger tins - it will end up being a flat cake. For 8 inch tins double the recipe. The chocolate cake batter will be sufficient to fill 2 x 8-inch tins perfectly. However, there will likely be a little too much vanilla cake batter - fill the tin 2/3 full and use any excess batter to make a few cupcakes. Bake the 8-inch cakes for 23-25 minutes. I have not made this cake in large tins, but my guess is that slightly more buttercream would be needed to frost the cake as pictured. Either increase the recipe - maybe scaling up to use 7 egg whites - or make the buttercream in the proportions given and opt for a lighter thickness of buttercream around the edge giving the cake a naked style appearance.